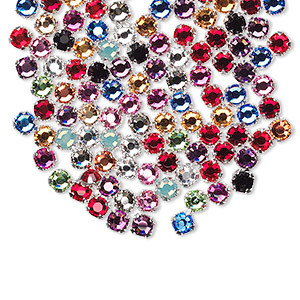 Bead mix, Swarovski® crystals and silver-plated pewter (tin-based alloy), mixed colors, 6.32-6.5mm rose montées (53103), SS30. Sold per pkg of 144 (1 gross). Item Number: H20-9654CY Have a question about this item? Rose montées (pronounced mohn-tayz) are flat back crystals with a lower profile than chaton montées that come pre-mounted in a silver-plated pewter (tin-based alloy) base metal setting with two stringing directions. Sew onto material, use in wirework or incorporate into beadwork. 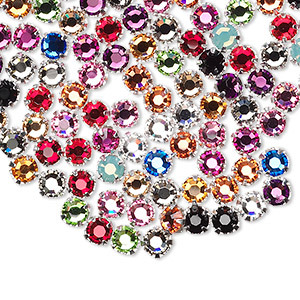 Bead mix, Swarovski® crystals and silver-plated pewter (tin-based alloy), mixed colors, 3.8-4mm rose montées with 0.75-0.85mm hole (53102), SS16. Sold per pkg of 144 (1 gross). 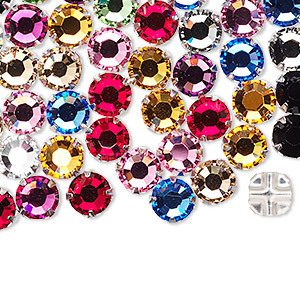 Bead mix, Swarovski® crystals and silver-plated pewter (tin-based alloy), mixed colors, 3-3.2mm rose montées with 0.4-0.6mm hole (53100), SS12. Sold per pkg of 144 (1 gross).